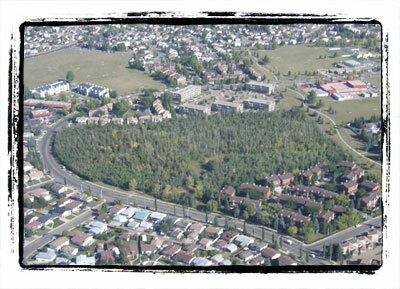 This woodlot is one of the largest remaining patches of natural forest within the developed areas of Edmonton. Composed mainly of deciduous trees, the woodlot has several openings in its canopy that allow a diversity of shrubs to proliferate. Among the many shrubs is a surprising abundance of mountain ash, whose bright red berries provide a splash of colour during the fall months and a source of nutrition for birds during the winter. This woodlot provides interesting nature viewing opportunities at other times of the year as well, including migrating birds during spring and fall migration and nesting birds during the summer. Trail network through the treestand with connections to the neighbourhood trail network. 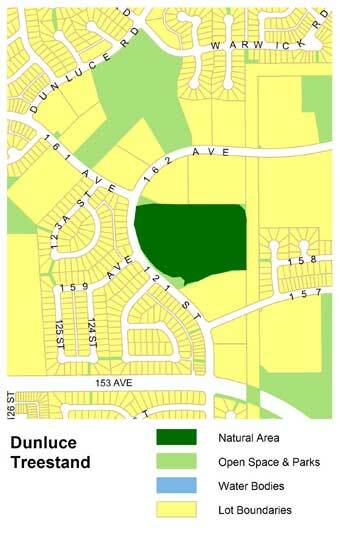 Dunluce Treestand is located on the eastern side of 121 St. between 159 and 161 Ave. Trail access is provided at 121 St. through the interior of the stand and connecting with the major north-south multi-use trail system located to the east of the treestand. Parking is limited at the site, but there is street parking along adjacent roadways. The size of the Dunluce Treestand provides many opportunities for a variety of species to live for parts or all of their life cycles. You will find an excellent diversity of bird species and small mammals at this site and the trails through the interior of the stand provide a great way to investigate all this site has to offer.